Brown-GPU was optimized for communities running traditional, tightly-coupled science and engineering applications. Brown-GPU was built through a partnership with Dell and Intel in March 2018. 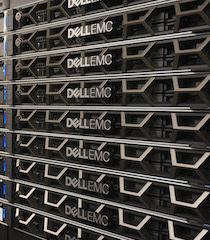 Brown-GPU consisted of Dell compute nodes with two 12-core Intel Xeon Gold "Sky Lake" processors (24 cores per node), 96 GB of memory, and three Tesla P100 GPUs. All nodes had 100 Gbps EDR Infiniband interconnect and a 5-year warranty. Brown-GPU was named in honor of Herbert C. Brown, Nobel Laureate and Professor of Chemistry. More information about his life and impact on Purdue is available in an ITaP Biography of Herbert C. Brown. All Brown-GPU nodes had 24 processor cores, 96 GB of RAM, and 100 Gbps Infiniband interconnects. Brown-GPU nodes ran CentOS 7 and use Moab Workload Manager 8 and TORQUE Resource Manager 5 as the portable batch system (PBS) for resource and job management.